In 1986, The Legend of Zelda introduced some of the most recognizable video game superstars of all time, and since then, each new Zelda game has added to the series’s dramatis personae, introducing new characters and re-imagining familiar ones. 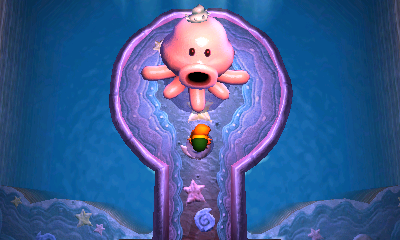 A Link Between Worlds, the most recent continuation of the Zelda legend, is no different. It brings together a diverse cast of fun and likable characters, doing its best to make each one – no matter how minor – stand out. To celebrate this achievement, I’ve decided to highlight my absolute favorite characters from the game. Without further delay, find out which A Link Between WorldS characters made a strong impression on me after the jump. Hyrule has been home to many wacky characters with unconventional interests. 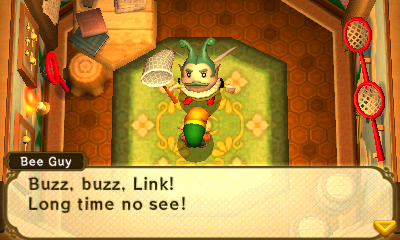 Between Tingle wanting to become a fairy and Aigitha taking bug collecting to creepy extremes, you’d think we’d have seen the weirdest of them by now. This enthusiastic fan of buzzing creatures from A Link Between Worlds, however, proved that Nintendo hasn’t run out of freaky character concepts. Wearing one of the goofiest costumes ever seen in a Zelda game, Bee Guy – as the odd little man is called – has turned his Kakariko Village home into a shrine to his honey-producing friends. He even promised Link top dollar for capturing and bottling bees for him. When someone displays such unadulterated adoration and passion for something, it’s hard not to remember their antics with a smile. He also has a wealth of bee puns, and who doesn’t love those? It’s hard not to empathize with Mother Maiamai. Not only did she lose all her children before the start of the game, but some jerk then decided to seal her inside a cave. Thankfully, Link came along to free the strange creature, and promised to track down her Lost Maiamais. Mother Maiamai’s bulbous squid-like appearance is only the first hint to her otherworldly origins. She overflows with alien powers, including the ability to jump between worlds and enhance Link’s items by swallowing them. Like a friendly eldritch abomination, Mother Maiamai is one inter-dimensional squid creature you want on your side. 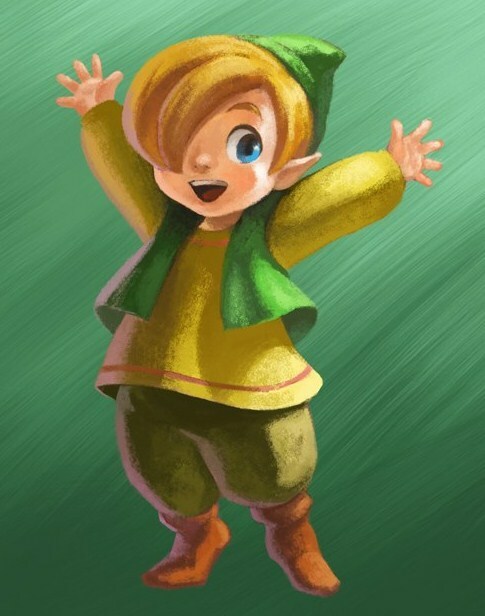 My curiosity was piqued when Nintendo released concept art for A Link Between Worlds showing a young boy who also wore Link’s signature green cap. Based off his appearance alone, I incorrectly guessed that he was going to be Link’s little brother in the game. As we all know now, Gulley isn’t a blood relation of our favorite hero, but the son of Link’s blacksmith mentor. This, however, didn’t stop the developers from giving the two boys a brotherly relationship. Gulley is surprisingly conscientious for his age. Not wanting to see Link get yelled at for being late to work, he wakes him at the start of the game, showing clear concern for the sleepyhead hero-to-be. Link eventually returns the favor when the younger boy is abducted by Yuga. Unlike many of Gulley’s fellow Sages, Link had a personal reason for freeing him besides the need to save Hyrule. Knowing that Gulley’s parents were drowning in worry at home created powerful motivation for rescuing the little guy. 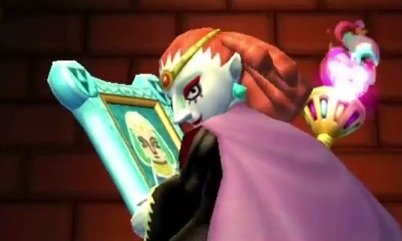 After the success of Ghirahim as Skyward Sword lively antagonist, Nintendo decided to take flamboyant villainy to the next level in A Link Between WorldS, creating the drag-queen-esque magician Yuga to serve as the game’s villain. Taking on the look of a clownish witch, Yuga spends the story’s first act kidnapping the Seven Sages of Hyrule. In an outrageous display of his malevolent powers, he transforms each of his successive captives into paintings. Between his disturbing fixation on the beauty of his captives, and his lack of anything close to a moral compass, Yuga is a fun villain to see in action. He is vanity personified, a sociopath with a twisted aesthetic taste. He takes advantage of each of his scenes to put on a theatrical display of wickedness. He showers petty criticism on the people around him, reveling in his shallow gloating. His rude behavior is only matched by his cruelty; his willingness to make the people around him miserable for the sake of his own selfish desires. He has everything a good Zelda villain should have: an over-the-top love-to-hate personality. That the whimsical and friendly item merchant Ravio made my list shouldn’t come as a big surprise. 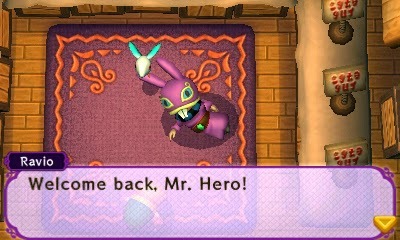 Ravio is the character people will remember from A Link Between Worlds, due both to his unique fashion sense and the central gameplay role he plays. Donning a purple rabbit suit that obscures his face, Ravio lent and sold Link an arsenal of equipment to aid him on his quest – for the right price of course. Accompanied by his pet bird, Sheerow, Ravio is a crafty merchant with good intentions. He encouraged Link to succeed on his quest, offering him a kind word whenever he was faced with setbacks. Without spoiling too much, the reveal of his true identity was a surprise twist that tied perfectly into the game’s fiction. His noble heart and laid-back personality, however, are what grounded Ravio as a likable character. Like the Happy Mask Salesman, Ravio is one eccentric Zelda merchant who will be remembered for years to come. The young witch Irene is the closest to a companion Link has on his quest to thwart Yuga. 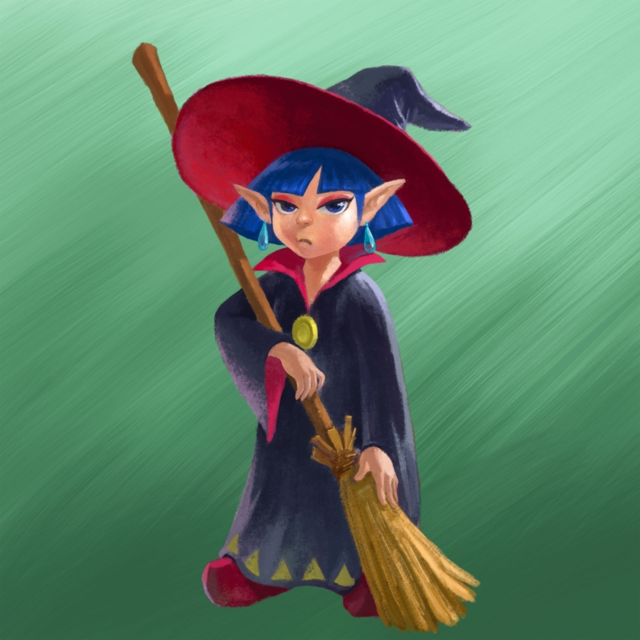 Throughout the game, her broom provides him with dedicated fast travel, whisking him from location to location. This immediately sets Irene up as a legitimately useful character. All the while, her snarky and spur-of-the-moment personality endeared her as a likable person. I especially like Irene’s pragmatic reason for acting as Link’s dedicated taxi service. She only started helping him because a fortune teller predicated that she would need a hero to save her sometime in the future. She then gradually befriended the boy, personally giving him rides until she was kidnapped during Yuga’s hunt for the Seven Sages. After Link fulfilled the fortune teller’s initial prophesy, she continued to aid him by directing her broom from the Sacred Realm. 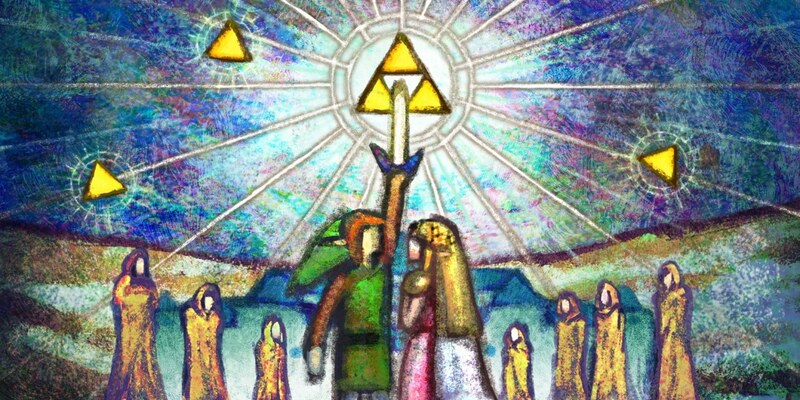 The developers succeeded at building a subtle, yet endearing friendship between Link and Irene. Her character, however, does not revolve entirely around the young hero. She is also shown to be close to her grandmother, who runs Hyrule’s largest potion shop. Reuniting the elderly woman and her spunky granddaughter serves as further motivation for Link to succeed on his quest. Irene is a witch with personality, which is why she is my favorite character from A Link Between Worlds. What are your favorite characters from Link’s 3DS adventure? Feel free to discuss them and my picks in the comments below.